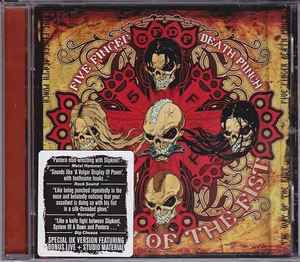 A version was also released in a standard jewel case, Five Finger Death Punch - The Way Of The Fist. And there is a misprinted version in a standard jewel case, Five Finger Death Punch - The Way Of The Fist. Big Thrilling Music/Vomit God Music - track 13, administered by Universal Music Publishing Ltd.
All tracks recorded at Next Level Studios and Complex Studios - Los Angeles 2006 - 2007, except Track 13 recorded at Korn Studios March 2008, Track 14 recorded at Rockstar Arenas, March 2007.